“Where can I find the best food in Singapore?” I get this question from overseas visitors all the time. Forget about the fine dining restaurants, or the best cafes in Singapore. If you have limited time during your trip here, just go for the hawker food – it is definitely one of the things to do in Singapore. I am sure many Singaporeans living in the West are familiar with Jurong West Food Centre. It emerged the winner in the Favourite Hawker Centre category of City Hawker Food Hunt 2010 through an islandwide SMS vote. I was surprised when I heard the result. It is not easy to win the title of the best Hawker Centre in Singapore when there are so many popular ones like Chomp Chomp, Old Airport Road market, Maxwell Food Centre and Bukit Timah Hawker Centre. Some of the stalls in Jurong West Food Centre were closed when we went there for dinner. Nevertheless, we still managed to eat quite a lot of food between the five of us. After walking around the hawker centre for a while, I settled on claypot rice. The best part about having the Chicken Claypot rice from Chinatown Claypot is the short waiting time. If you order the small portion for one person, it takes just five minutes as they have prepared it beforehand. For the bigger portions, it is probably at least twenty to thirty minutes. It is often said that eating is our favourite pastime. After witnessing the long queue for the fish porridge, I’d like to add on to say that queueing up for food is probably the second hobby. As much as I love food, I think it is crazy to queue up half an hour for a bowl of fish porridge. Anyway, I was not particularly impressed with the one that we had here. But then again, I am sure there is a reason why people are queuing up for this, maybe I am missing something? 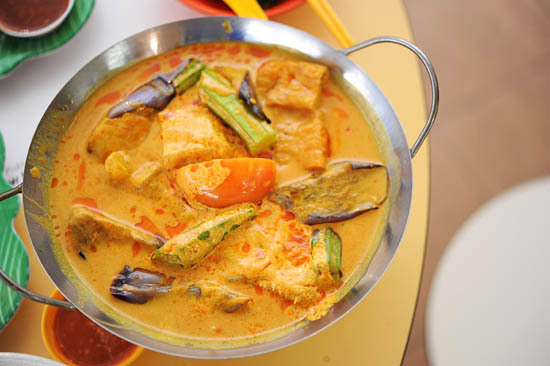 Located just beside the fish porridge stall, Hai Nanyang Curry rice also has a short queue waiting for their curry. I thought that the fish head curry ($6) that we had was quite good. We were craving for Char Kway Teow and Oyster Omelette that day. And it so happened that there was only one stall selling them, and the food was run-of-the-mill. Thankfully, we had good Kueh Tutu to make up for the disappointment. The Kueh Tutu stall was extremely popular. When I tweeted that I was having dinner at Jurong West Hawker Centre, everyone replied and asked me to try the Kueh Tutu there. If you go to Jurong West Hawker Centre, you must try the fish ball noodles there. The Chicken Rice stall near the ATM machine is also worth a mention. It is very easy to spot them as they always have long queues. In terms of size, Jurong West Food Centre is definitely not as big as Old Airport Road market or Maxwell Food Centre. But there are a few popular stalls that are worth making a trip west. 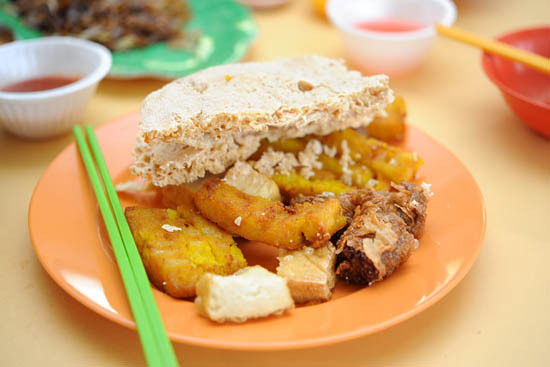 Is Jurong West Food Centre really the best hawker centre in Singapore? Tell us your top 5 food centres! I’ve been a Westie for 23 years but nv knew jurong west hawker has that many good stalls. haha! CHOMP CHOMP is one of my favourite hawker centres because of the chocolate tau huay stall and availability of a ginormous glass of sugarcane juice. Have you written a review on Chomp Chomp previously? Just wondering, how many people were the food shared among??? Wow, either you have a huge entourage with you or you have a huge appetite. Hahaha Cheers B! That’s because you went to the wrong stall for fish! Ha. There’s one stall (think it’s called Heng Heng) that has very fresh fish for its fish soup and has damn huat sambal chilli! (though they’re sometimes stingy with it) Business is so good that they’re usually closed before 2.. I can’t get enough of that fried oyster and egg. The last time I was in Singapore, I ate 3 plates everyday for 3 days until I was sick. Then, on the 5th day, I started the whole process all over again. Thanks for sharing. Yep, the famous stall is Heng Heng Cooked Food that sells sliced fish soup. This has an even longer queue! Be prepared to wait for at least 30 minutes. I’ll gladly queue for it though it’s a tad expensive (at least $4), but I seldom have to chance to eat it because of their weird opening hours – Mon to Sat 9am to 2pm; Sun and PH OFF (!!!). the authentic food culture is abit limiting here in perth… but we’re slowly getting there..
For me the best stall was “Tiong Hwa” char-kuey-tiao, but unfortunately the uncle passed on some years ago, leaving the food centre with a major gap in one of the most ubiquitious Singaporean hawker food. The other wonderful stall was “Si Er” duck rice/porridge. However, the uncle also retired a while back. I’ve not been back for a while since I moved out of the estate some years ago. But, that place is definitely a fantastic hawker centre. The fish soup at the row facing the POSB ATM is good though the chili at Heng Heng is much better. The stall you tried is the worst of the 3 but it’s still not bad. You should try the braised duck kway teow at the same row as the Ngoh hiang. The Chee cheong fun & yam kueh at the stall just near the kueh tutu is nice too. They serve it with a red sweet sauce instead of the normal dark one. Heng Heng fish soup is really one of the best smabal chili i’ve eaten in all hawker centers! The Soo Kee chicken porridge is nice too! Jurong West’s Kok Kee wanton mee is definitely cheaper than the one at Lavender. think Kok kee have only 2 stalls in singapore.. i’m sure a regular customer of jurong west’s kok kee! Yes, the chee cheong fun & yam cake stall, facing carpark, is really good! similar to the sliced fish soup stall, they usually sell out by lunch time! Ya Heng Heng fish is best in Singapore! Chee Cheong Fun and Wanton mee is best there.. Cannot miss. Last time used to have the fried kuay tiao..but owner retired le..
Joshua, do u have any idea does the duck rice stall operates dinner time? the chicken rice stall beside the fish soup it very nice it always has long queue. always visit in the morning cause most of them don’t operate after lunch. I enjoyed the Heng Heng fish soup stall for the shiok chilli. Prepare to wait, only start at 9am. Hi anyone know the operation hours for this hawker centre? we plan to visit the West this coming Sat. Thanks. If u want good food for dinner, u should probably try the Cze Zhar steamboat stall at Mei Ling food center. It only charge 1/3 of any outside restaurant prices and the food is much better. This hawker center also have large tables for 10 persons to sit together. Go try Ah Pang Steamboat Sea Food. It is worth it!